You are here: Home / Food! / Around Alison's table / Holiday baking – easy as 1, 2, 3.. If you are away from home in a rented apartment or villa for the holidays, there is generally not the kit for baking a cake. But this simple recipe is light and delicious and takes all of five minutes to make. 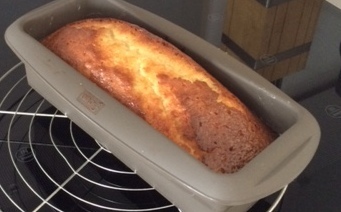 You don’t need scales or an electric mixer for this cake, just a pot of natural yogurt, a bowl and a whisk! Okay a silicone cake mould too, but that you can fit in your suitcase! Take 1 pot (as in a single serving) natural yogurt and tip it into a medium to large size bowl (like a salad bowl). Keep the yogurt pot! 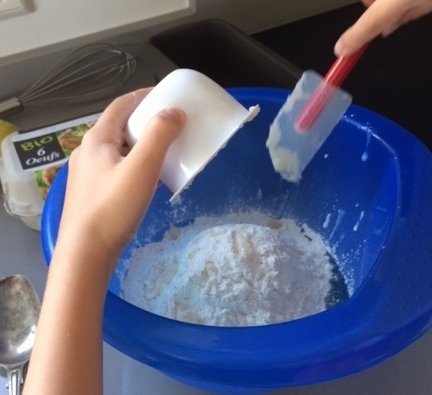 Fill the yogurt pot 3 times with self raising flour, adding to the bowl each time. Add three eggs to the bowl; that is your 3. Bake in a pre-heated oven,170° for 35 mins or until golden and a skewer comes out clean. 1, 2, 3 done! I added finely grated lemon zest to my mix and as soon as it comes out of the oven I prick it all over with a skewer then pour over a lemon syrup made 5 minutes before the end of cooking time: The juice of 1 lemon and 50 g sugar (approx. 3 desert spoons), heated until the sugar melts and has reduced a little). Or leave it plain and once cool cut a slice and smother in local jam! It is so easy to make, the children can make it by themselves whilst you enjoy another chapter of your book by the pool! Great recipie, thanks for sharing!